Exercise can prevent chronic disease, boost mental health and elevate quality of life. But exercise can also be an expensive undertaking — especially for newcomers. A personal trainer costs an average of $50 per hour, according to WebMD. Alternatives, such as low-cost or free exercise apps, may yield low-quality workouts that are not adapted to individual preferences or lifestyles — which ultimately dampen their effectiveness. To address these shortcomings, researchers at the University of Washington and Seattle University created CrowdFit, a platform for exercise planning that relies on crowdsourcing from nonexperts to create workout regimens guided by national exercise recommendations and tailored around user schedules and interests. As the team reported in a paper presented April 25 at the 2018 CHI Conference on Human Factors in Computing Systems in Montreal, in a field evaluation, nonexperts could create exercise plans as effective as experts under certain conditions. In addition, CrowdFit improved the quality of exercise plans created by nonexperts. Compared to nonexpert exercise programs prepared via Google Docs, nonexpert plans created using CrowdFit featured more appropriate levels of exercise for each user, a better progression of activities from week to week, more appropriate strengthening routines and better compositions. "Most apps available to the public offer limited ability to customize an exercise plan — criteria like goals, age and weight," said lead author Elena Agapie, a UW doctoral student in the Department of Human Centered Design and Engineering. "With CrowdFit, we designed greater flexibility to customize exercise plans to a user's schedule, constraints and nuanced preferences." "We previously saw that people can craft plans for others that are challenging and interesting, but also had shortcomings with respect to exercise science," said senior author Sean Munson, a UW assistant professor of human centered design and engineering. "In this study, we set out to test whether supporting planners with information on exercise science and feedback from users could help them produce plans that are also high-quality in this respect." "By involving nonexperts in the process, there's also an opportunity to increase these nonexperts' exercise knowledge, ultimately benefiting not just the users, but also the planners," said co-author Gary Hsieh, a UW associate professor of human centered design and engineering. Subjects in the first group received exercise plans crafted by nonexperts — volunteers who lacked the formal education and expertise of a personal trainer — using CrowdFit, which also contains information on exercise guidelines. 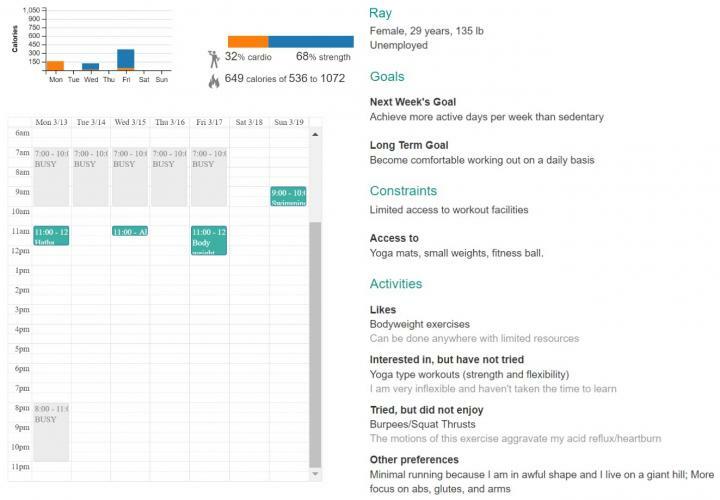 The second group received exercise plans created by personal trainers, who used Google Docs to view the users' profile information and deliver their plans. The final group received exercise plans crafted by nonexperts, again using profile information and plan delivery via Google Docs. Subjects followed their plans for one to two weeks. "Our study has demonstrated that nonexperts can be guided through designing an exercise plan that is consistent with national recommendations," said co-author Molly Welsh, an assistant professor of kinesiology at Seattle University. "There may not yet be a substitute for a trainer prompting a person through a routine on the gym floor, but the role of the expert is expanding to become more collaborative with the tech industry in guiding future design choices of apps." "We hope that tools like this will contribute to a common goal: to increase the adoption of lifelong exercise by all," said Welsh. UW team members are part of the "Design, Use, Build" group — or DUB. Additional co-authors are UW doctoral student Bonnie Chinh, research associate Laura Pina and Diana Oviedo, a former UW graduate student now at Microsoft. The research was funded by the National Science Foundation.